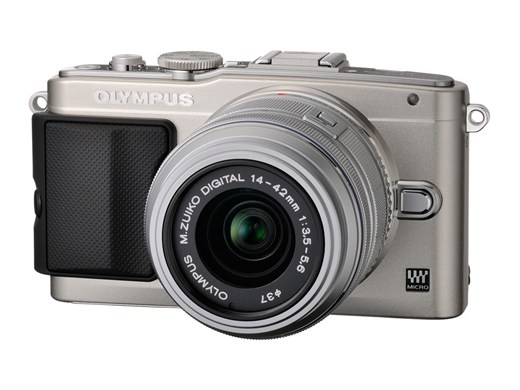 Olympus has announced a number of new products. First up are the PEN E-PL5 (pictured above) and E-PM2 cameras. The main new feature is the 16 megapixel sensor that is the same the OM-D EM-5's, which is truly excellent, being a Sony sensor. Other new features include the AF system from the E-M5, and a new 3" touchscreen HVGA LCD. In the E-PL5's case, the screen can be tilted up to 170 degrees, making it possible for self-portraits. BOth cameras offer 1080p video at 30 FPS as well. The main difference between the two cameras is in that tilting LCD screen, and a mode dial with a few extra buttons for the E-PL5. Both cameras still do not offer a built-in flash, instead they will be packaged with a small external flash like their predecessors. Ships in October for US$700 for the E-PL5 with the 14-42 lens, or US$600 for the E-PM2 with the same 14-42 lens. Next up, the Olympus XZ-2. The original XZ-1 was something unique, as it offered a 28-112mm equivalent f/1.8 - 2.5 lens that was still pretty bright across the entire range. Now in 2012, the same lens is a little less competitive, given that both Panasonic and Samsung have similar cameras that feature a f/1.4 lens at the wide side, which are also wider at 24mm equivalent. The main upgrades are in the new 12 megapixel CMOS sensor, a tilting 3" VGA LCD screen, and a new detachable grip like the E-PL5 above. 1080p video at 30 FPS is present. Ships in November for US$600.